Rate indicated is for deposits between $10,000 to $1 million. You can invest in this option if you are an AustralianSuper member and have more than $10,000 in the account. Rates applicable to depositing with the range of $5,000 up to $2 million. For deposits which have a term of less than 12 months, interest is paid on maturity. For deposits which have a term of 12 months or greater, you may ask have your interest paid monthly, quarterly, six monthly or annually. Rate quoted is has minimum investment of $5,000. Rate is applicable to deposits ranging from $20,000 to $5,000,000. Rate indicated is for the range between $100,000 to $499,999. Rate indicated is for Online Term deposits between $5000 to $1 million. Minimum deposit of $250,000 required for residents to open the account. Minimum deposit of $20,000 for non-residents. The current interest rate for this term deposit product is for a 1 year period and applies to deposit amounts or balances ranging from $250,000 to $5,000,000. Interest paid at maturity. The interest rates applicable for this 6 month term product is for interest paid at maturity for $250,000 to $5,000,000. Please Note: Other deposit products include options for interest paid monthly, half yearly and annually. 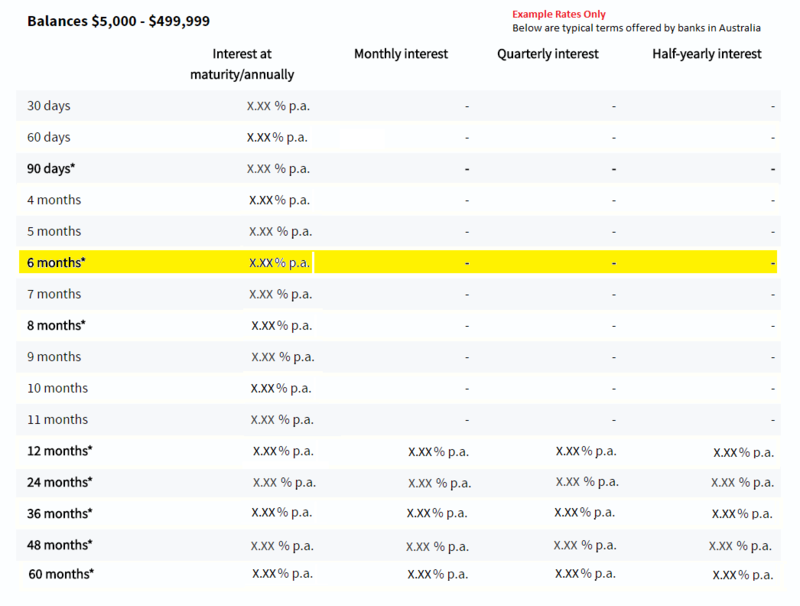 Rate is applicable for deposit amounts from $100,000 to $499,999 paid interest at maturity. The interest rate for this one year product is at maturity and deposit balances ranges requires a minimum of $5,000 up to amounts over $5,000,000. This annual interest rate yield indicated for this 6 month/180 day term deposit product requires greater than $50,000 to $1,999,999. For other interest amounts other rates may apply. The deposit interest rate for this product is applicable for deposit amounts of $5,000 to $249,999 at maturity. Rates applicable with minimum opening balance of $10,000 and interest paid monthly, quarterly, annually or at maturity. The 6 month TD product is a popular offering provided for retail customers from banks. Considered a short term product, it is heavily influenced by RBA decision directions. Below shows the interest payment options from a large national bank in Australia. 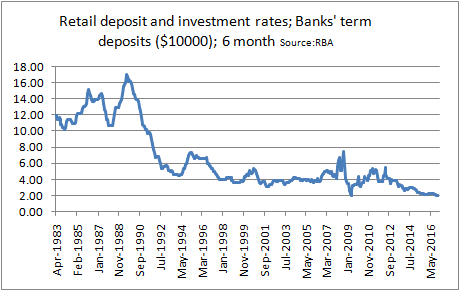 For such a short term rate it peaked at over 16% in 1988/1989 falling to about 2% in 2016.